All around us the signs of autumn are beginning to make an appearance. Despite the lingering sunshine and warmth there are tell-tale signs that the year is turning ever onwards towards the darkness of winter. In Gaelic there are two words for the sun depending on the time of year, and for now we have moved into the time of the little sun, with it’s weakening rays and shortening days. It’s dark now by 7pm, and this change in light has started the change of colours which we all love so much in the autumn. The green leaves of summer are becoming a little tattered and frayed around the edges. The evening dog walks are happening earlier and earlier, as the nights draw in, and the squirrels are very busy among the trees building their winter stores. The dogs are fascinated with the squirrels, giving sudden chase whenever one crosses the path. Willow walks at this time of year with her head looking skywards, on constant squirrel watch. The view upwards is beautiful, with the first orange leaves beautifully lit by the low angled sun. One by one the green leaves turn orange, become crisp and dry, and they tumble away from the trees. Spiralling and twisting in the soft warm breeze, drifting and dancing down towards the soft black earth. Every now and then in a sudden swirl of wind the leaves on the ground spiral up to mix and drift with the falling leaves. The air is filled with autumns dancing leaves, and low shafts of sunlight, and it steals my heart. Each moment is filled with so much beauty, so much of natures breath and movement, that it weaves a spell of mindfulness holding me in the perfect moment beneath the trees. Meanwhile autumns jewels are glistening among the ferns and bushes. 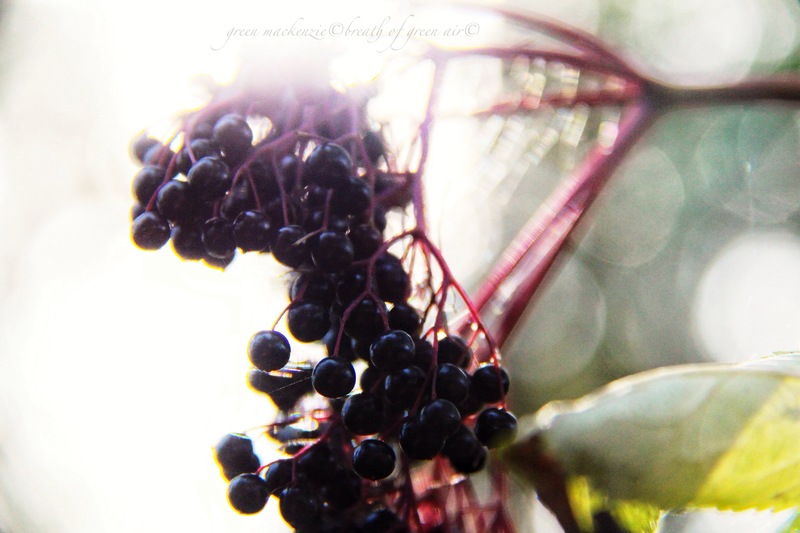 Rich purple elderberries plump with glittering sun, and wreathed in hand spun webs, weight down their slender branches. Cool moist mahogany conkers litter the forest floor, glinting in pools of sunlight, hiding among the fallen leaves. Evoking childhood memories, it’s hard to resist gathering a few. To hold and turn a freshly fallen conker, is to tumble back to the past filled with hope and laughter among the autumn trees. There is so much to hold us, so much to fill our minds, that worries spill away with the drifting leaves. Back at home there are more signs of autumn. 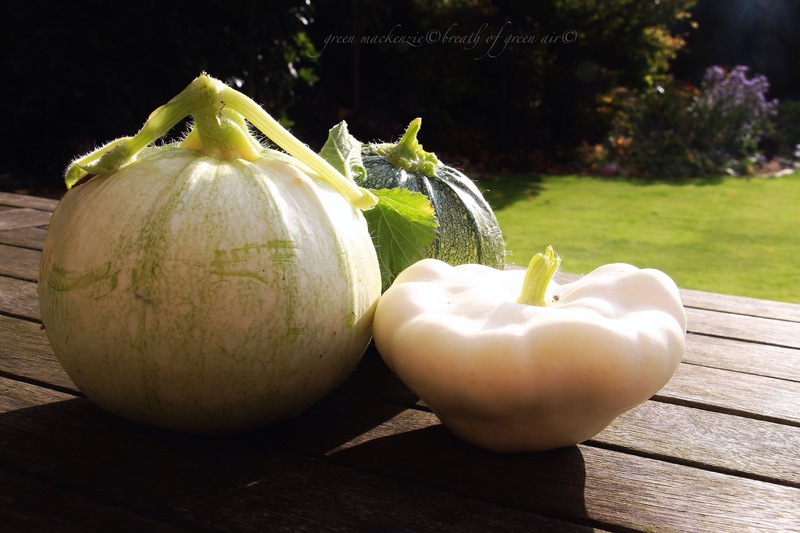 The squashes are ripening at an alarming pace, and I’m running out of recipies. The shadows have crept all the way across the lawn before the washing is quite dry, such a difference in just a few weeks. I love to see the signs of Autumn, and to feel the change of the season? It’s as though the world is taking a long soothing breath out, after the frantic restless energy of summer……I wonder if everyone likes this time of year as much as I do? This entry was posted in change, mindfulness, weekly photo challenge and tagged Autumn, change, mindfulness, nature, photography, postaday, relaxation, woodland. Bookmark the permalink. You seem to have lovely autumn weather – here the leaves are blowing away…before reaching their richest colours. Lovely post – as usual! What a beautiful world you live in :-). Your posts make me want to move to Scotland :-). I am fascinated with the changes in color, lighting, mood, energy level that autumn brings. I love the abundance of the harvest…and I dread winter even as I know that resistance is futile. Love the Gaelic concept of the “little sun” – perfect for the diminished power of the sun in winter. The little sun never burns us, and only has the power to keep the greenwoods (evergreens) alive. Resistance is indeed futile, and yet we can’t help ourselves, but you know I’m certain I would find perpetual summer boring! I always love to meet a fellow Autumn lover David. Delighted to read how much you enjoyed the post with its memories and sense of change. 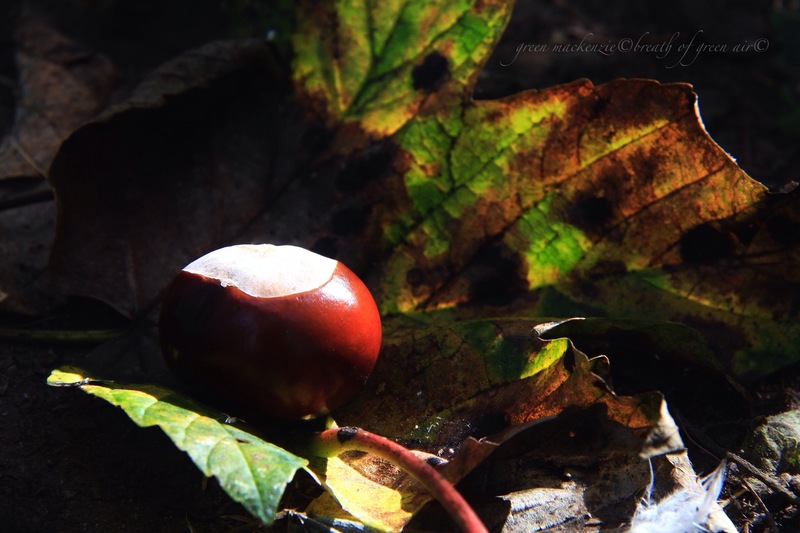 Conkers always make me smile, and autumns colours are so uplifting. I’m hoping for a few crisp, sun filled days to come…. A wonderful photo essay. 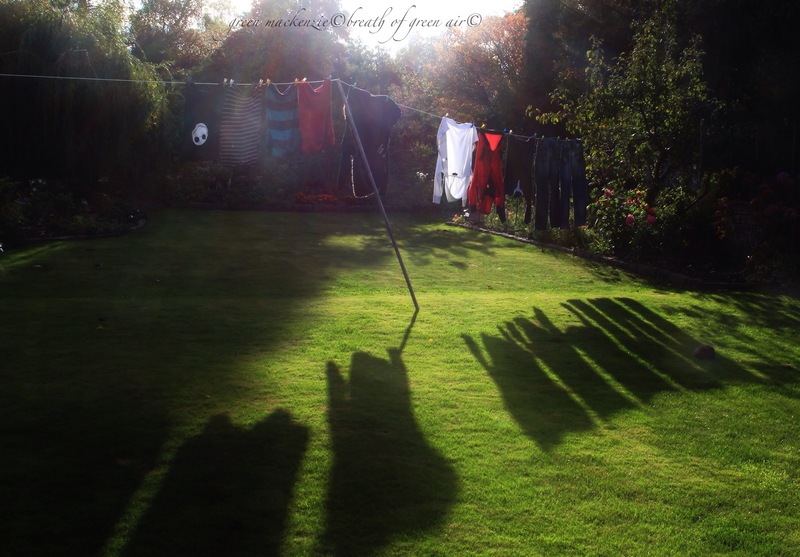 I just love the long shadows and the clothes on the line. Perfect for the season! And I certainly don’t think you’re a weirdo, or if you are you’re in great company….I’m loving Autumn too! Decay and nascent renewal is a gorgeous way of putting it. Me too I love the autumn, it’s OK to go inside again and calm down, focus inwards. Beautiful words and images as always (the “autumn jewels” were the ones to steal my heart this time!). Yes Seonaid, I love autumn although I don’t want to because it brings dread of what will follow. It’s the time of year when I struggle most to be mindful. Your photos are stunning as always my dear. 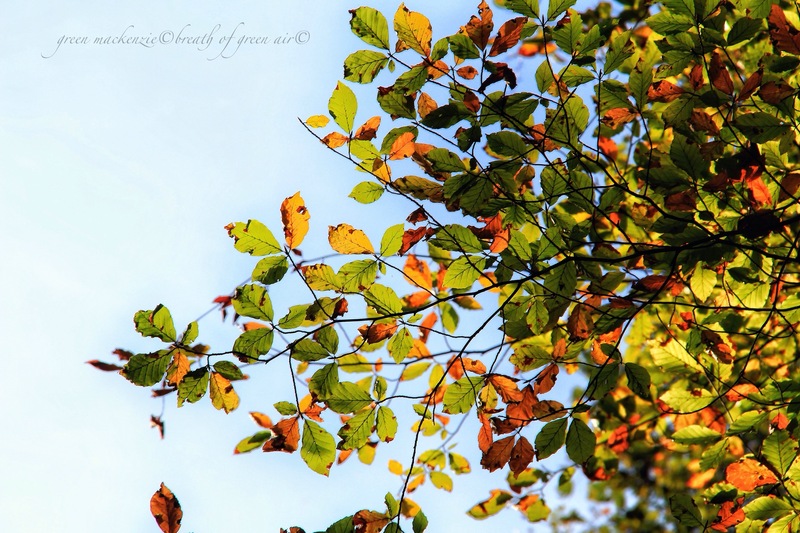 Just let the colours and the swirling energy of the leaves hold your attention…..
Gorgeous autumn images, Seonaid. I so remember playing with those conkers on pieces of string at school. Seems a lifetime ago now. 🙂 Your doggies are so adorable. When Molly saw me taking photos of the conkers she got curious about them and gave them a tentative taste…..she spat it back out very quickly! You take such dynamic pictures… I applaud you! Yes, here in the NW corner of the U.S. our daylight hours are shorter too. The leaves are changing and pretty wilted since our summer was so unusually hot this year. But the best part of the season is the cool mornings and evenings. The days are sunny, but the temperatures have calmed down. Fall and Spring are my favorite times of year as I LOVE the earth tones and the richness of the world around us. Thank you! Gwynn it really is a lovely time of year, great for walking and taking photos….two of my favourite things 🙂 The colours and the swirling leaves are just so pretty. What I love about this time of year is the colour. Nature truly looks stunning when you walk among the trees. 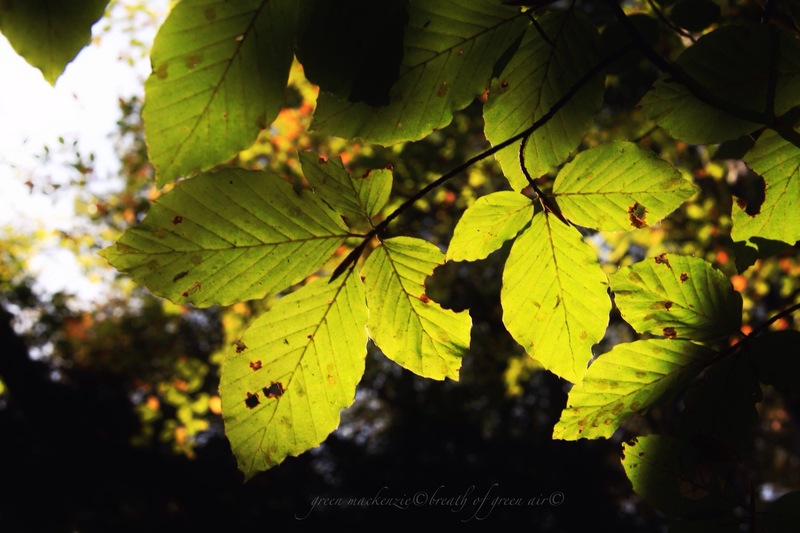 What a beautiful, eloquent autumn post, Seonaid! You weave a totally compelling magic spell around the season, Seonaid. I can’t help but be captured by the colours and shadows, but I so don’t like the chill bareness that is to follow. The chill bareness isn’t here yet, so linger a while enjoying the season we are in. Winter will come in its own time….and it will bring spring in its wake! My pleasure Andrew, it was lovely to hear how much you enjoyed that washing line shot. 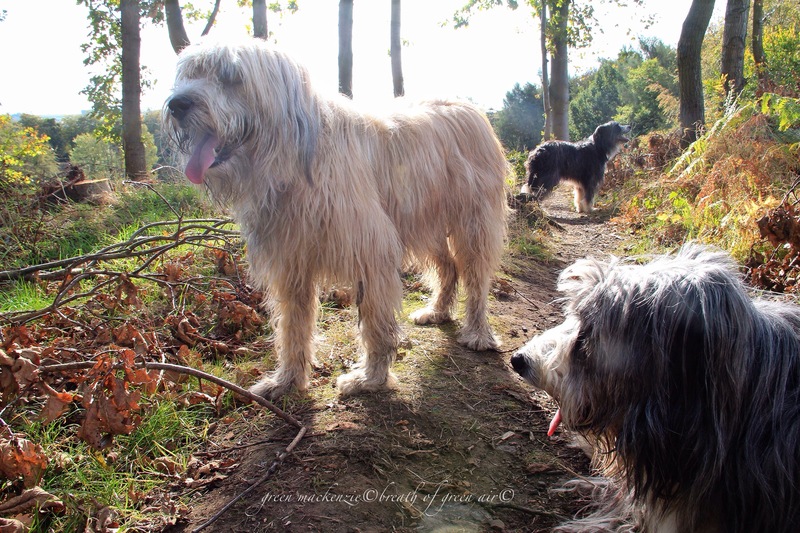 The shadows were what drew me…..I love the length of autumns shadows! I’ve run out of recipes for squash, too. And pumpkin. I hadn’t realised conkers were a purely British thing. They are so pretty, but the game we played as kids was great fun…..even though it resulted in some sore fingers and hands! Learned a new word from your lovely post: I didn’t know what “conkers” were, but now I do! I didn’t realise that conkers were a UK thing! Great minds do indeed think alike Seonaid! Loved your post and love fall as much as you do, except that it’s also a harbinger of winter, which is NOT my cup of tea! Also love your adorable pups’ appearance–ever on the alert! I loved the look of your autumn signs. Rather than dwelling on the winter to come I try to stay with the beautiful season which is with us…..winter will be here soon enough…..but of course it then gives way to colourful spring! Autumn has so much to offer. fine post: love that shadows shot with the washing line. Thank you, I couldn’t resist the washing line shot…..although the washing itself, my sons, is far from picturesque the light was so good!